1888. No 165. Manufacturers name plate from a Broad Gauge locomotive in the Azores (2015). 1882 April. 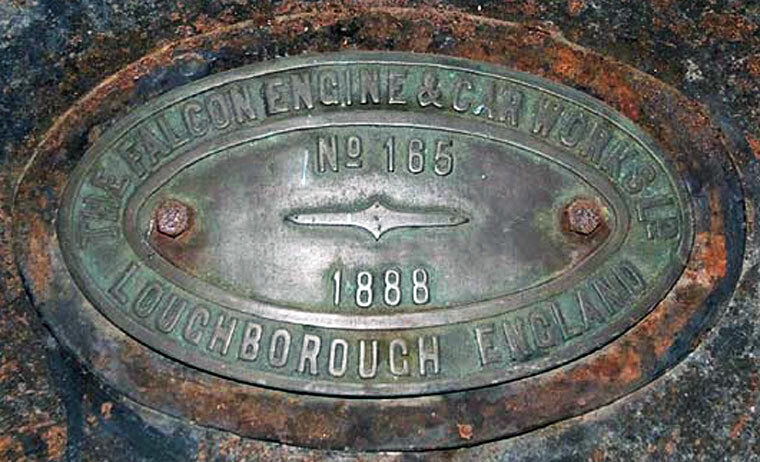 Falcon Engine and Car Works was formed as a new company with capital of £60,000. 1882 April. Announced that Norman Scott Russell will join the Falcon Engine and Car Works as chief manager. 1882 July. Serious fire destroys the works. 1883 Due to a recession, Henry Hughes and Co (or Hughes's Locomotive and Tramway Engine Works) was in financial difficulties. The company was taken over by Norman Scott Russell and renamed the Falcon Railway Plant Works. The factory remained busy with both railway and tramway locomotives and rolling stock. Among these were tank locomotives for Ireland, Spain and the Azores. Some were subcontracts from other firms, such as Kerr, Stuart and Co, at that time in Glasgow. 1883 Kerr, Stuart and Co of Glasgow acted as agents for their locomotives. This page was last edited on 19 July 2016, at 09:20.